One day after Duke teammate RJ Barrett announced his decision to enter the 2019 NBA Draft, Cam Reddish followed suite. Reddish announced the decision on his Instagram page. One of the top recruits in the 2018 class, Reddish teamed up with Zion Williamson, Barrett and Tre Jones to help Duke advance to the Elite Eight and a 32-6 record. Duke's Cam Reddish will enter the 2019 NBA Draft, per his Instagram page. Reddish missed two games this season, playing in 36 contests while averaging 13.5 points and 1.6 steals per game. 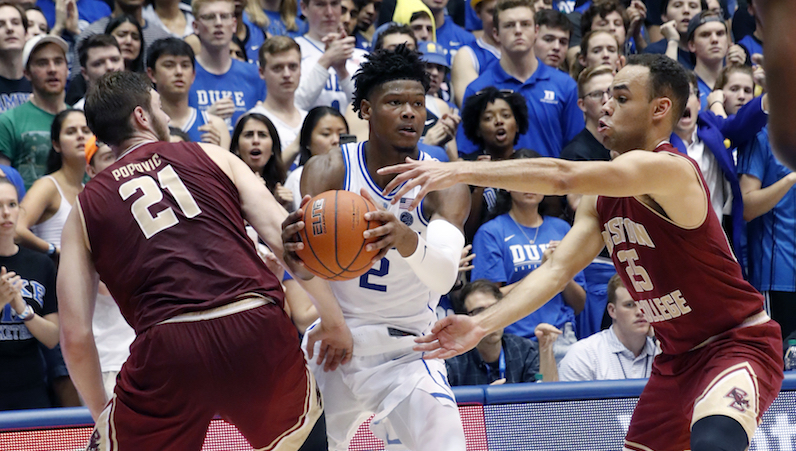 A dynamic defensive prospect (2.1 steals per 40 minutes), capable of guarding multiple positions, Reddish struggled with his offensive during his one season at Duke. His 3-point game (33.3 3P%) never quite got online behind a hefty volume of attempts — 7.4 3PA per game, nearly 62 percent of his field goal attempts. There’s something to build on here, though. Reddish’s drive game had its ebbs and flows, too. His handle will need work (20.7 percent turnover rate), as will his ability to finish through contact at the rim (7 dunks, 51 FG%). However, the 6-foot-8 Reddish still projects as an intriguing two-way prospect — one with a strong pedigree, a solid frame and 3-and-D potential. He will likely go within the lottery range of the 2019 draft.